It's time to enter to win $200 cash which couldn't be at a better time since Christmas is coming! 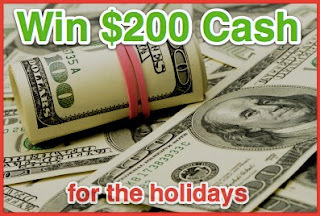 Tip Hero, the place to save money, is sponsoring this giveaway and it's easy to enter. $200 might wrap up your Christmas list or give you that extra nudge to bring a smile to someone's face or even buy your Christmas dinner for you! I could get my kids Christmas gifts! I would treat my family to a nice dinner out! Would be a blessing to win for the holidays ! I would get a rug for our living room! If I won i'd be using it all towards Xmas gifts. I would put it towards making Christmas extra-special for the kids. Thanks! I'd use it for Christmas presents or groceries, one or the other. With Christmas coming up I'd love to use it for gifts for my family. Sadly, in reality, I'd probably use it to pay bills. Would like to shop Jan sales. I could buy lots of Christmas gifts. I would give it to my grandson's mother who is having a difficult time. I'd get new bed linens. I would use it towards holiday shopping! I would be able to buy my family Christmas presents better. Buy christmas presents for family! I would use it to buy Christmas gifts for my two grand daughters. I would use the money on my nieces and nephews! I would have a dinner party. Thanks for the giveaway. I would use it to get the Nintendo 3ds that my daughter wants. thank you! I would use some for Christmas gifts and the rest for groceries. I would buy Christmas presents for my daughter. I would spend the money on car repairs.